The opening ceremony of this year’s food festival started with One Thousand People Drinking Coconut Juice and other colorful coconut themed activities with local characteristics. The 2012 Sanya International Food Festival kicked off Tuesday at Dadonghai Square, and will run until New Year’s Day. More than 100 local catering players including international brand hotels, local signature restaurants and well-known snack businesses have been attracted and set up booths. Meanwhile, a series of cultural performances will be staged during the festival, allowing local residents and tourists to enjoy the cultural activities while sampling the delicious cuisines from different regions. 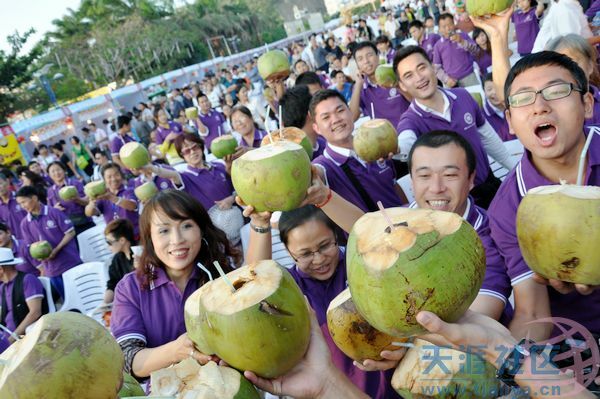 Differing from the previous festival, the opening ceremony of this year’s festival started with One Thousand People Drinking Coconut Juice and other colorful coconut themed activities with local characteristics, including setting up the coconut wishing tree for blessing Sanya and collecting best wishes for the New Year. Apart from the traditional culinary event, the highlights of the 8-day festival included the 7-themed series of gala evening shows in combination with Christmas celebration, Li & Miao ethnic elements, snowbird culture, a DJ concert, local music and a New Year’s countdown celebration to promote the internationalization of Sanya as a tourist destination.